RFEM uses the finite element method based on the updated Lagrangian formulation and the displacement formulation. Nature is nonlinear. Although we often look to simplify the world around us, with the increase of hardware capacity and software improvements in the last decades the linearization of real life engineering problems is not always necessary. RFEM offers a huge variety of nonlinear models covering many areas of use. In order to achieve maximum computational efficiency, calculation is parallelized on different levels – the direct Cholesky linear solver is parallelized by parallel elimination of matrix rows, the dynamic relaxation method is parallelized through its natural explicit definition. Many other blocks are also parallelized (local element matrix assembly or beam cross-sectional mesh generation). The large deformation theory and post-critical analysis differ only in the nonlinear methods used. The latter choice allows the calculation of post-critical behavior of a structure which goes through a singular point, i.e., where the stiffness matrix becomes singular. For a detailed description of the nonlinear methods, see section Nonlinear Solvers below. In case of the large deformation theory, the axial strain is computed with respect to the actual and not reference length, as in the first-order theory. Under a sufficient number of load steps, the axial strain numerically tends to a logarithmic strain definition. In case of beams computed under the large deformation theory, the axial stiffness is computed directly according to the logarithmic strain definition, which gets precise results with one load increment only. The first method is faster except for large positions, where the iterative approach can be less time demanding. The iterative linear solver, on the other hand, can be easier parallelized. The choice between the nonlinear and the linear solver is up to the user. The Newton–Raphson nonlinear method is preferred in case of a continuous right-hand side. In case of discontinuities, the Picard method can be used (especially in combination with the Newton–Raphson as a corrector) as a more robust choice. The post-critical behavior, where the solver has to overcome limit points with singular stiffness matrices, is either solved by the modified Newton–Raphson or by the dynamic relaxation method. In this method, the tangential stiffness matrix is calculated as a function of the current deformation state and inverted in every iteration cycle. In the majority of cases, the method features a fast (quadratic) convergence. This method is also known as the fixed-point iteration method. It can be thought of as a finite-difference approximation of the Newton method. The difference is considered between the current iteration cycle and the initial iteration cycle in the current load step. The method does not converge as quickly as Newton's method in general, but it can be more robust for some nonlinear problems. The analysis starts as the Picard method and then switches to the Newton method. The idea behind this is to use the robust method far from equilibrium and the fast convergent method near equilibrium. The first n percent of iterations, for which the Picard method is used, are set in the Calculation Parameters dialog box. This method is like the Newton–Raphson method. The difference is that the stiffness matrix is assembled only once in the first iteration cycle. It is then used in all subsequent cycles. Therefore, this method is faster, but not as robust as the Newton-Raphson method and the modified Newton–Raphson method. where M is the lumped (diagonal) mass matrix, C is the diagonal damping matrix, K is the stiffness matrix, dependent on the solution u in the nonlinear case, f is the vector of external forces, u is the discretized displacement and rotation vector, n is the dimension of u.
where omega_i is the i-th eigenfrequency, qi is the unknown solution component corresponding to the eigenfrequency omega_i, Di [−] is the relative damping corresponding to the eigenfrequency omega_i, and fi is the corresponding right-hand side. The superposition rule is either square root of the sum of the squares (SRSS) or complete quadratic combination (CQC). The direct integration method is based on the implicit Newmark method, which is second order accurate in time and absolutely stable. The Newmark method uses a constant time step approach. A large database of cross-sections is available in RFEM. Hybrid beams, which allow more than one material for the cross-section, are also supported. Each beam can be further equipped by a release (= hinge, in general nonlinear) on each side. Kirchhoff theory (no transversal shear considered, suitable only for thin plates). The Kirchhoff theory is available only for linear calculations. Defined by stiffness matrix (This plate type allows the user to define an arbitrary plate defined by an 8×8 stiffness matrix. This definition allows the definition of unsymmetric compositions also. Initial calculation of the stiffness matrix can be made outsideand imported into RFEM easily from Excel (and exported also)). Without tension surface – plate made of isotropic material. The calculation is nonlinear due to the effect occurring, for example, in masonry walls: under tension the plate loses its in-plane stiffness. Bending is handled linearly. Rigid plate – plate with rigid stiffness. It is internally modelled by a high stiffness value, which is set automatically by a couple of orders higher than the surrounding construction, which allows the plate to behave rigidly and to be numerically stable at the same time. Laminated plate – RFEM allows the analysis of laminated plates (= multilayered plates). Any number of layers with material orthotropy is allowed. An unsymmetric composition is supported. The transversal shear calculation is based on the Grashoff formula. Stress/strain dependence throughout the plate thickness can be shown graphically in any point of the plate. Safety glass – safety (laminated) glass is a multilayered plate consisting of glass and foil layers. The elastic properties of glass and foil differ significantly – by a couple of orders. Due to the significant difference in stiffness, there is a significant difference in the angles of the normal lines (the deformed points are connected to create the normal lines in each layer). These special plates are solved by solid elements to handle the situation accurately. Insulating glass units – in insulating glass units, glass layers (or safety glass layers) are combined with gas layers. Gas is simulated by solid elements (see the section List of All Elements for more details). Large-deformation calculation is necessary in this case. The calculation allows the consideration of solar flux radiation and infinite ray reflections in the glass unit. Membranes – surfaces with no bending stiffness (textile, for example). Isotropic as well as orthotropic membranes can be defined. The calculation is nonlinear due to the effect which occurs in real membranes – under compression the membrane loses its stiffness. Membranes can be calculated only with the large deformations. Let us note that RFEM also has the feature of nonlinear form-finding techniques, which allows finding the unknown shape of a membrane surface that is useful in membrane structure design (circus tent design, for example). Note, that curved surfaces in RFEM are approximated by planar finite elements. In nodes where planar elements are joined, deformations and rotations are forced to be equal. This approximation converges with a finer mesh to exact values on curved surfaces. Free concentrated load – A free concentrated load acts as a force or moment on any location of the surface. Free Line Loads – A free line load acts as a uniform or linearly variable force along a freely definable line of a surface. Free rectangular / circular / polygon load – A free rectangular / circular / polygon load acts as a uniform or linearly variable surface load on a rectangular / circular / polygon, freely definable part of a surface. Nodal and line supports can act with respect to any degree of freedom (ux, uy, uz, fix, fiy, fiz), can work in the rotated coordinate system, and it is possible to add linear springs in any direction. Nodal supports are further equipped with many nonlinearities like nonlinear springs defined by a multilinear diagram, by partial activity behavior (not acting in the case of positive or negative force in a particular direction), or by friction (stiffness dependence on force in a particular direction). Linear and surface supports are further equipped by partial activity behavior (not acting in case of positive or negative force in a particular direction). A release (= hinge) between two nodes allows the connection of any degree of freedom (ux, uy, uz, fix, fiy, fiz), allows the definition of linear stiffness between any degree of freedom, and is also equipped with nonlinearities: nonlinear hinge behavior defined by a multilinear diagram, partial activity behavior and fixed-under-condition behavior (fixed, if My is positive, for example). A special possibility is a scissor release. With a scissor release, you can model crossing beams. For example, there are four members connected at one node. Each of the two member pairs transfers moments in its continuous direction, but they do not transfer any moments to the other pair. Only axial and shear forces are transferred in the node. 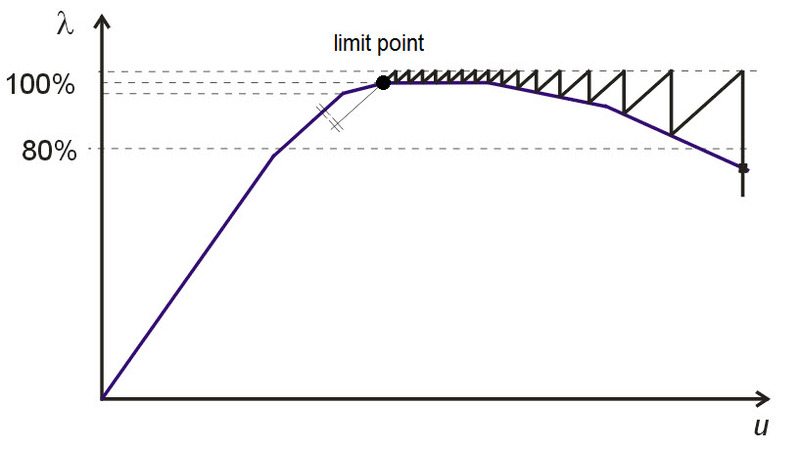 A line release in RFEM allows linear behaviour only. Isotropic hardening is implemented in all of the above mentioned material models. The latter three models (Orthotropic Plastic 2D, Orthotropic Plastic 3D and Isotropic Masonry 2D) allow the definition of bilinear hardening, all other nonlinear material models allow the definition of multilinear hardening, defined by a diagram). Kinematic hardening is not available. Another feature is the calculation of cables (special type of member) and membranes (special type of surface), which have no bending and compression stiffness. The calculation process lowers the stiffness in compression, which makes the calculation nonlinear. Large deflection theory (third order theory) is necessary to be used in that case. where w(x) is the beam transversal deflection, N is the axial force (N > 0 means tensional force), E is Young's modulus, Iy is the bending moment of inertia and q(x) is the pressure load. We easily see that by considering the axial force N constant, the equation is linear. If the axial force N is zero, then the equation (1.4) reduces to the standard Euler–Bernoulli beam equation. In RFEM the second-order theory is available not only for beams, but also for plates and solids. and rotations, the resulting equations would be nonlinear. However, this approach is not used in RFEM.